Vladimir Putin: de-facto "Czar" of Russia and in many ways the most impressive current head of state in the world. Rising from being a suspected murderer and terrorist as an officer in the KGB, he has since been the very model of an effective-if-autocratic right-wing leader. It was during his first premiership and presidency (1999-2008) that Russia's economy grew by nearly triple and her status as an energy superpower became clear. He has since continued to demonstrate qualities including strategic restraint and masterful diplomacy which are lacking in other world leaders. Positive: Pallas quincunx and widely parallel Mercury, and sesquiquadrate Venus which rules Mercury and the Sun. Negative: Pallas quincunx Pluto and ruled by Jupiter and Neptune which both aspect Pluto. These factors subside over time because Pluto is conjunct the South Node. A typical "whistleblower" configuration: the chart leans to the authoritarian in youth but becomes less so over time. This would be consistent with the suspected youthful terrorist who becomes the relatively reasonable elder. Economic-Leftist: Venus ruled by Pluto which is conjunct South Node and sextile Neptune, and by Mars which is trine South Node. Unclear: Venus widely square the Nodes. Second house ruler Jupiter square the Nodes. Wishy-washy or conflicted configurations often end up on the Right/capitalist end of the spectrum, and I suspect the Venus/NN parallel overcomes some of the other factors. Conservative: North Node on the IC. Pat Buchanan also has this, hence the feeling of kinship. Liberal: Moon is ruled by Mercury which is conjunct Neptune. Fourth House is ruled by Saturn (which is conjunct Neptune) and Uranus (which is square Neptune). The North Node apparently overpowers the other factors, but again: conflicted configurations usually end up on the Right. 1. The anti-Pallas features are listed above. 2. Economic-Leftist features listed above. 3. Pluto rules and is widely square Venus, trine Venus co-ruler Mars, and square Second House ruler Jupiter. 4. Pluto widely square Moon and sextile her ruler Mercury. 5. Pluto septile Sun (which is ruled by Venus: see point 3). Whether or not Putin was a mass-murderer/terrorist in his younger days, the chart suggests he could have been but is not likely to be one now. Pluto at the MC: power/authority. 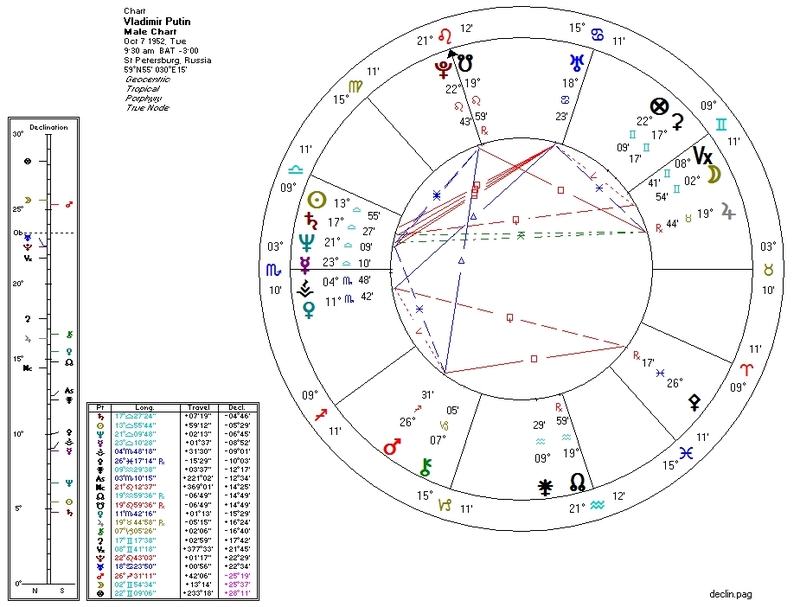 Pluto trine Mars in the Second House: great physical power "on display" (as Noel Tyl often describes Second House planets). Pallas square Mars: high dexterity and/or command of physical action. Moon ruled by Mercury which is configured with Pallas: fighter/martial-artist. Pallas configured with both Moon and Pluto: a "James Bond" type -- elite military or covert operative potential. Mercury/Venus at the Ascendant: diplomacy. Sun/Saturn/Neptune/Mercury stellium in the Twelfth: perhaps a highly idealized public image of power/authority which may hide something a bit different. Uranus in Cancer in the Ninth square Sun/Saturn: populist elements in his domain publicly rebelling against his authority. I'm a libertarian (surprise) and don't believe in imposed authority. But if you're going to have imposed authority, you could do far worse than Vladimir Putin. I suspect he will continue to avoid all-out war as long as the West doesn't force him into it. If he is allowed to peacefully hold the (strategically vital and ethnically Russian) region of Crimea against Western-funded national-socialist and other forces, I doubt he'll push his way into the rest of Ukraine.